You’re running out of space in your chests? Need more space? 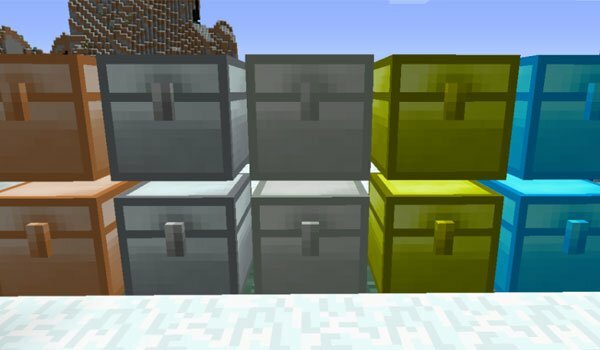 You’ll be really interested in this mod for Minecraft chests with different features. IronChests 1.7.2 and 1.7.10 is a mod designed to work with Industrial Craft and BuildCraft because requires some recources of this mods that you won’t find in the normal version of Minecraft such as copper and silver. With this mod can create several chests, using from iron to diamond and getting more and more space in our chests. The materials for the chests, from low to high capacity are iron, copper, silver, gold and finally diamond and crystal that have the same capacity. The only difference between these two is that in the crystal can view content from outside as it is glass. How to install IronChests Mod for Minecraft 1.7.2 and 1.7.10? Paste the downloaded mod file inside .minecraft/mods folder. Plenty of different types of chests with increased capacity!